After a pleasant breakfast in the open-air restaurant of our hotel in Moshi, we were picked up by our guides, Rashid and Rama. At Rashid’s insistence we stopped by an outdoor gear shop in town to rent additional cold weather gear—snow pants and a heavy down parka. After freezing on top of Mt. Meru, we were easily convinced that the extra layers would make our experience on the summit of Kilimanjaro considerably more pleasant. We had a fairly long drive to get to the entry point since we were doing the 8-day Lemosho Route which starts on the west side of Mt. Kilimanjaro National Park. After clearing one checkpoint for paperwork (oh, how the Tanzanians love their bureaucracy! ), we finally arrived at Londorossi Gate where the lengthy, chaotic and occasionally antagonistic weigh-in process took place. Each porter is limited to carrying 20 kg of gear and food, including their own, and it was fascinating to watch the guides jockey and haggle to limit the number of porters they needed to hire to take their clients up the mountain. Waiting at the gate was a group of local day laborers hoping to be hired to join an expedition as additional porters. Their work is grueling, but the pay is significantly better than most other jobs available in Tanzania. Regardless, it was difficult to see so many local villagers waiting for the slim opportunity to work, only to be turned away. 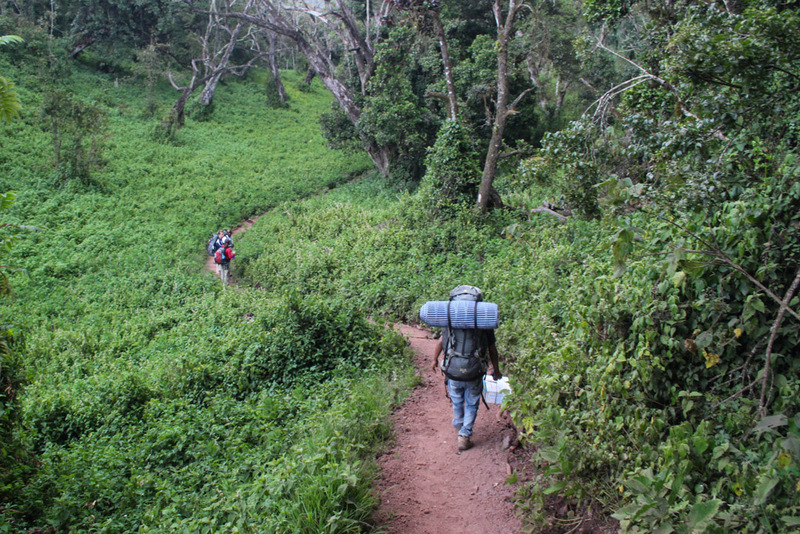 Once each porter’s bag had been leveled to the exact maximum allowable weight, we piled into the 4 x 4 Land Cruiser for a bumpy, white-knuckle drive up a poorly-maintained logging road to the Lemosho Glades, the official start of our trek. The three of us set off with our guides, Rashid and Rama, our cook Mussa and his assistant Jimi, along with 10 additional porters (Hassan, Mudi, Rama II, Juma, Samba, Nelson, Edward, Salim, Shaban and Bakari) many of whom we would get to know better along the way. There were fourteen Tanzanians in all for our small group of three, and it was hard to shake the odd feeling of colonialism weighing on our conscience as we prepared for the long journey ahead. The first day’s hike was a short 3-hour stroll through lush montane rainforest, the first of five ecozones we would pass through on our way to the summit. We began at 2360 meters and ascended to 2895 meters on a fairly comfortable path before arriving at Big Tree Camp, where multiple groups camp together in a small village of tents and dining huts. As our crew prepared dinner, we were entertained by several black and white colobus and blue monkeys rustling about in the large, shady trees, no doubt attracted by the prospect of an easy meal. After an appetizer of hot tea and popcorn, a hearty dinner followed: cucumber soup, boiled potatoes with a vegetable curry, fried fish and cabbage with bananas and orange slices for dessert. Since Tanzania is near the equator, the sun sets predictably every day around 6:30 pm, and the temperature drops rapidly soon after. Camp gets quiet in a hurry after dinner, especially with all the fresh air and exercise had by all. Thoughts of a warm, cozy sleeping bag and a good night’s rest lured us into our tents, and we turned in shortly after dinner for the night. Practical Information: Before heading to Tanzania, I had high hopes of using a DSLR to record film-quality HD footage of our trek, but you can see that this video was shot with a regular old video camera. Despite my best intentions, I didn’t have a lot of time to practice recording with my DSLR before we left, so I was nervous to document this once-in-a-lifetime trip with so little experience under my belt. The one thing I had definitely learned from my pasta-making video endeavor was that using a DSLR would require lots of battery power and even more storage. Facing eight straight days on the mountain with no opportunity to download footage or recharge batteries, using the DSLR seemed too impractical. Ultimately, I didn’t shoot as much video footage as I had hoped. The trails were extremely dusty, and the footing was often quite slippery, which ultimately forced me into keeping my video camera packed away in the safety of my daypack most of the time. Sounds like your off to a great start! It’s always slow getting going, but here is hoping that everything goes smoothly for you. You are so right, Andy. It seemed like the weigh in process took forever, and we were relieved to finally hit the trail and see what we had in store for us. Thanks for reading! Just curious, are clients typically accompanied by so many folks? I read the part about having two guides, plus the cook and his assistant, and thought that sounded like a lot for three clients. My mouth fell open when I read there were 10 porters, too! Yes, the ratio of guides/cooks/porters to clients is really high, and it seems to go up exponentially the larger the group is. They are carrying all of the tents, sleeping bags, food, cooking gear, etc. for the whole climb. We were just a shocked to see the truckload of porters following us as we drove into the gate on our first day!